Danny "Dan" Lee Burton (born June 21, 1938 in Indianapolis, Indiana) is the Republican U.S. Representative from Indiana's 5th congressional district, which includes the suburban counties of Indianapolis. Burton grew up in an abusive family; his mother, a waitress, was kidnapped by his father, and was sent to live in a country home. Burton has said that "I think part of my agressive nature is because of my childhood. When I was five, six years old, my mother used to stand between me and him when he'd start to beat me and take the blows. I was black and blue from my neck to my ankles." Without finishing college, Burton enlisted in the U.S. Army at 18, and went on to become a successful real estate broker and insurance salesman. 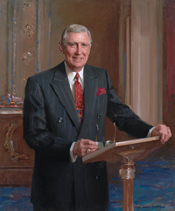 He was elected to the Indiana House of Representatives in 1966 and State Senate in 1968. After two unsuccessful attempts in 1970 and 1972, he was elected to Congress in 1982. Burton has a reputation of being gaffe-prone. During the Clinton Administration he claimed that the death of White House Counsel Vince Foster was a murder, staged as a suicide. He also once pushed for universal, mandatory AIDS testing. Burton currently serves on the House Foreign Affairs Committee and is former chairman of the Government Reform Committee.